The storytelling is sometimes messy. The tone is often heavy-handed. The production woes show through at times (especially in episode two). The uniforms are far from sensational. The Klingons look weird. Michelle Yeoh is still nowhere near as strong a performer when she’s not working in her native language. The visual aesthetic is a bit too dark at times. Someone should have realised that the Klingon language is no fun to listen to for extended periods. But it still feels like Star Trek. There’s been some very strong reactions to Star Trek: Discovery – both positive and negative – and one of the most common negatives I’ve heard is ’this isn’t Star Trek’. Which is weird, because what it reminds me of most three episodes in – especially in part 3, the strongest episode yet and one of the best bits of Trek I’ve seen in ages – is the old ‘Classic Crew’ movies, especially Star Treks II and VI, which really played up the naval and ’submarine war’ aspects of life on the Enterprise. It’s no surprise, considering the director of Treks II and VI, Nicholas Meyer, is a consulting producer, and it’s a pleasure for me, because that’s my favourite flavour of Trek. I’m not really a ‘fan’ of Trek. I enjoy the hell out of it when it works, but I’ve never followed it religiously. The Original Series never exerted the pull on me that Doctor Who did when I was a child, The Next Generation had a two season run (end of S3 through to beginning of S5) when I watched it regularly, but then I drifted away, and I never clicked with DS9, Voyager or Enterprise. The 2009 reboot gave me a brief sugar rush of excitement that wore off pretty quickly, especially when I rewatched it and realised how shoddy some of the storytelling in the movie is, and I did think for a while that Trek had been lost to the world of shallow wham-bang blockbusters. And now we have Star Trek: Discovery, which is far from perfect, but is genuinely trying to revive the old-school nature of Trek – that it’s humanistic morality tales in a pulp sci-fi wrapping – and the results are more often successful than not. I think some fans are struggling with the fact that (a) the emphasis so far is on war, and (b) that we’ve gone back to before the original series again, and (c) IS IT CANON? To which I’d say, (a) this is a character-centric 15 episode series with what’s meant to be a self-contained, clear arc, where the central protagonist is obviously on a difficult journey of healing and redemption, (b) going back to war with the Klingons helps because that’s one of the archetypal Star Trek set-ups that almost everybody knows, and (c) this is pretty much another soft reboot, at least from an aesthetic perspective (for example – Star Fleet now have Star Wars-style holograms now, to avoid endless scenes of people talking on screens). They’re trying to meld the approach of the Classic Crew movies with the visual flash of the Abramsverse, and the results are pretty good. Of course diehard fans are going to complain – hells teeth, I’m a Doctor Who fan, and in that fandom, diehards complain about ANYTHING. But the third episode hints that despite some clumsy teething troubles in part 1 and 2 – especially some murky world building around the Klingons, who now seem to have a weird Egyptian Death Cult thing going on (and also seem to be big fans of the over-opulent production design on The Chronicles of Riddick) – Star Trek: Discovery may be on to something, especially in the way it’s pushing its main character into some really difficult and challenging directions. Episode 3 also makes it clear why episodes 1 and 2 were kind of a self-contained ’set-up’ story, because all the heavy lifting done there really pays off. 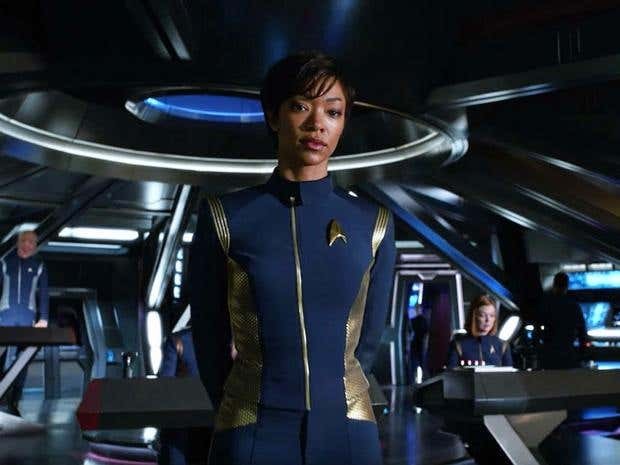 Sonequa Martin-Green is doing impressive work in the lead role, Doug Jones is wonderful as Saru, and this is the kind of story we haven’t seen before in Star Trek. There’s a long way to go – whether episode 3 points to how good the show could be or just turns out to be a quality blip remains to be seen. For now, though, while I’ve never been a ‘true’ Star Trek fan, I’m enjoying Discovery, and I’m glad that there still seems to be room in today’s TV environment for a return to Trek’s intellectual and humanistic (if occasionally clunky) space adventuring. Dark Souls III made me want to stop playing computer games. This was not in the predictable, ‘It was too difficult’ sense. 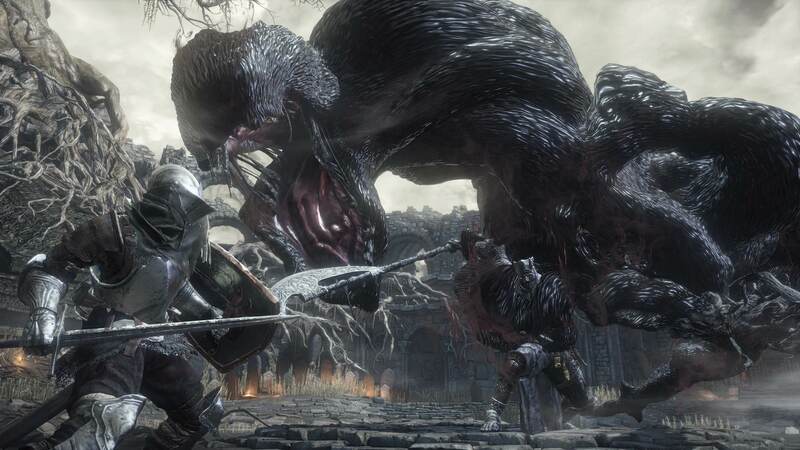 The Dark Souls games (and their ‘sister’ game Bloodborne) are ferociously exacting in terms of gameplay and difficulty, but I didn’t give up part way through Dark Souls III. I ‘summoned in’ help frequently, using the online cooperative play that makes Souls games a weirdly honourable and fun place to be (especially for such bleak, punishing environments), and I didn’t actually make it through a single boss on my own, but I still battled my way through the entirety of the base game of Dark Souls III, and had an excellent, thrilling time. And then I stopped. And I haven’t really started again. It was while I was playing Dark Souls III that it really hit me how addicted I sometimes get to computer games. It’s understandable why they can offer such an escape from the real world when life is full of stress and long-term complications that aren’t easily solved. Games can give you easily quantifiable goals, with concrete rewards – gameplay loops that reinforce your urge to keep going, to solve problems, to get past that puzzle or to defeat that boss. Games have helped me a lot at times – my girlfriend’s two-week hospital stay in October 2016 (thanks to a nasty bout of appendicitis) was made more bearable by spending much of my free time burying myself in the game Middle Earth: Shadow of Mordor, running around leaping off high buildings and killing Orcs by the barrel-load. But suddenly, I could feel how much I needed that regular sense of reinforcement, that sense of achievement, especially in a game like Dark Souls, where exploration, puzzle-solving and combat are all mixed together into a heady stew. So I stopped. And despite a number of times when I’ve been tempted, I still haven’t properly picked up another game, after almost three months. I’ve been recently much more aware of my use of time, and I’ve been trying to organise myself better, to use the time that I have available in a better way. I want to get more done, I want to achieve things in life – and buying another massive computer game like, say, Horizon: Zero Dawn feels like too much of a time sink in terms of commitment. I’ve regularly gone through phases and obsessions before, but never one that’s ended quite so abruptly, and never one that I’ve felt so reticent and tentative about starting again. I’m not saying that I’m turning my back on games, or selling my PS4 – I still like knowing that I have the opportunity to play if I want to. And I may play some gentle, casual stuff that doesn’t eat massive chunks of my life. But for now, I think I’m going to be keeping my distance from games, at the least until my life is a little less crazy. I haven’t blogged for a while, and I’ve got no inclination to add to the endless selection of ‘2016 was awful’ posts. There were distinct ups and downs to 2016, but I want to talk about my favourite game of 2016, one that I’ve recently returned to playing. 2016 was, for me, an amazing year of games. On my first year of owning a PS4, I lucked into some very impressive games, some of which I played for over 100 hours, which is something I wasn’t expecting at all (my biggest gameplay total before was on the Mass Effect games, where I usually completed them after about 30 hours). But my favourite game of 2016? It’s The Witness, all the way. The Witness is a puzzle game that’s very heavily influenced by the old-school computer puzzler Myst. Like Myst, you’re on a mysterious island and have to figure out a series of puzzles. Unlike Myst, the puzzles here aren’t bewilderingly presented, confusing and a bit boring. And most definitely unlike Myst, the island you’re exploring here is HUGE, and crammed to bursting with puzzles. The basic principle of The Witness is that you trace a path on a maze, and this unlocks a new, slightly more difficult maze. The game takes this very simple mechanic – drawing mazes is literally the only way you can interact with anything in the game – and spins it out in so many directions it’s almost boggling. There’s barely any sense of repetition – the island is divided up into different areas, and each ‘zone’ mixes things up with a different variant, a different rule, a new twist that makes you look at the mazes in a different way. It’s a simple gameplay loop, but my goodness it’s addictive. At first, there’s the joy of exploration – being able to see a new area beyond a gateway, and knowing that if you could just figure out what these odd symbols mean on this one particular panel, you’d be able to find out what’s going on over there. And then, once the game fully has its hooks into you, it’s gradually learning a different language, figuring out the relationship between one set of symbols, and knowing all along that there is a solution. The game almost always plays fair – there’s always a way of figuring it out, meaning that looking up a guide for the answers is pretty much defeating the point of the game. (Honesty time – there was one point where I succumbed, and there’s one type of puzzle I wouldn’t even have known about if I hadn’t glanced at a couple of guides. But other than that, I stuck to not looking, and I’m glad I did). The game is fully open world, not locking you into any specific area, and you’re encouraged to simply go and wander if you can’t figure out a particular puzzle. Certain puzzles don’t make sense until you’ve solved a completely different area of the island anyway, and it’s also a beautiful environment to explore, helped by the fact that there’s no music and (aside from the rather pretentious audio logs scattered across the island, mostly quoting famous scientists or philosophers) no dialogue. Only mazes. Probably the thing that I like most about The Witness is that it’s a game that I’ve properly ended up playing with my fiancé. Emma isn’t a regular game player in any way, and many of the games I play don’t click with her at all – but we’ve played massive sections of The Witness cooperatively, and it’s made it a wonderful experience, figuring out the mysteries and puzzles of the island together. It’s felt like being on an adventure, exploring the island, and I know I wouldn’t have found The Witness anywhere near as satisfying if it had been a more solitary experience. (And, to be honest, I’d probably have gotten a lot more stuck – Em is very good at spotting things and figuring out puzzles). The Witness isn’t for everyone. The vague, underlying narrative that’s hinted at doesn’t really work that well (although it’s so vague it might as well not be there at all). It’s definitely a pretentious game at times. And yet, no game in 2016 gave me quite as much joy, and no game saw me scribbling down so many diagrams and mazes, leaving one of my notebooks looking like I’d been trying to catch a serial killer. If you have any interest whatsoever in puzzle games, The Witness is an absolute classic. The island is waiting for you. Go explore. I have very little sense of personal embarrassment. I’ve done a whole selection of odd things in public – sometimes for a joke, sometimes because I was bored – so when my friend Tristan asked me back in the early 1990s if I’d spend a couple of afternoons running around the Cornish countryside dressed as ‘Marty’ and ‘The Wild Bunch’ star Ernest Borgnine, how could I say no? The result of those afternoons was ‘The New Airwolf – The Next Generation’, a ludicrous VHS-shot spoof of the mid-1980s action series ‘Airwolf’, which starred Jan-Michael Vincent as moody helicopter-piloting hero Stringfellow Hawke and Ernest Borgnine as his trusty sidekick, Dominic Santini. I owed Tristan for all the help he’d given me on a previous video project (our VHS-shot fantasy epic The Alchemist), so it only seemed fair, even when I ended up wearing a radioactive-yellow hat and had a sofa cushion stuffed under my clothes (to properly simulate the classic Borgnine ‘barrel-chest’ physique).